Vitamin A 14%, Vitamin C 12.5%, Calcium 21.5%, Iron 20.6%. 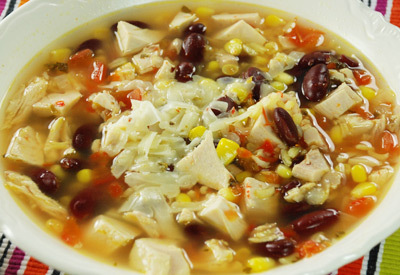 Prepared using low sodium chicken broth, low sodium kidney beans and low sodium corn. In large saucepan, combine chicken, broth, kidney beans, salsa and corn. Bring to a boil. Reduce heat and simmer uncovered 5 to 10 minutes or until chicken is no longer pink. Stir in rice. Cover; remove from heat and let stand covered 5 minutes. Top each serving with cheese.